Audio Desk Systeme of Germany and Acoustic Sounds, Inc. are pleased to announce the next generation, upgraded version of the award-winning ultrasonic LP cleaning system, the new Vinyl Cleaner PRO. Incorporating five years of evolutionary enhancements in addition to important upgrades to internal component parts, the Vinyl Cleaner PRO offers better features and performance, and also promises better reliability. Features of the new Vinyl Cleaner PRO include better, quieter drying, a new premium motor, an upgraded pump with ceramic bearings, and improvements to the electronic control system including a dry-only option. 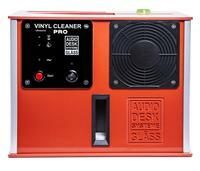 The Audio Desk Systeme Vinyl Cleaner Pro is the latest version of the first and only record cleaning machine that incorporates an ultrasonic cleaning cycle in addition to a more conventional mechanical cleaning via bi-directional rotating microfiber cleaning drums, and the result is the cleanest LP's ever. Unlike other record cleaners the ultrasonic Vinyl Cleaner bursts millions of microscopic bubbles off the surface of the record all the way to the bottom of the groove, where no fiber is fine enough to reach. And among LP cleaners the Audio Desk System Vinyl Cleaner is unique in using filtered air for drying, rather than one of the static-inducing suction systems employed by other record cleaning machines. This vinyl record cleaner is fully automatic - just put the LP in the slot, push the button, and come back in 6 minutes (or tomorrow!) for a thoroughly cleaned and dried LP (both sides). Whole new layers of inner detail and air are revealed in the recordings, and of course most surface noise is eliminated. Records are precious. Not only are they arguably the best-sounding medium for reproduced music, but they often constitute irreplaceable collections. Even with careful handling contamination cannot be avoided in the long term. It is also well known that residual compounds from the LP pressing process obscure inner detail unless removed by cleaning even new records. Reiner Glass of Audiodesksysteme has developed a professional quality, easy to use record washing machine he call the "Vinyl Cleaner". The Vinyl Cleaner is fully automatic. The record is placed perpendicularly from above into the equipment opening and the red activation button is pressed. When the green LED shines, the clean LP can be removed. During the cleaning process rotary cleaning barrels made from a microfiber material move in opposite directions while a unique ultrasonic system carefully and thoroughly removes even the finest contaminants from the grooves. In use the cleaning solution is thoroughly filtered to avoid recontamination of the LP. Two high performance fans guarantee effective drying with quiet operation. Cleaning Solution: 4.5 liters (1.2 gal) of distilled water added to 20ml of cleaning concentrate. Technical: How can sound clean? Ultrasonic is sound generated above the human audible level. A physical effect called "cavitation" results from the generation of ultrasonic frequencies in a liquid. In this cavitation process ultrasonic "compression waves" are created by an ultrasonic transducer. When the amplitude of this soundwave increases to a level where the surface tension of the liquid is broken, the fluid will "tear" apart leaving behind millions of microscopic vacuum bubbles. These vacuum bubbles then rapidly compress or implode creating millions of tiny liquid jets small enough to clean inside the smallest grooves of an LP. This process, also called "microagitation," displaces any contaminants on the surface of the LP.